Reston, Va. – In the featured article of the March 2017 issue of The Journal of Nuclear Medicine, researchers demonstrate that a new positron emission tomography (PET) radiotracer, gallium-68 (Ga-68)-pentixafor, can quickly and non-invasively identify life-threatening atherosclerotic plaques. The tracer binds to the CXCR4 receptor on inflammatory cells present in atherosclerotic plaques—making it possible to find and treat atherosclerosis early. Atherosclerosis develops over decades with the progressive accumulation of lipids, inflammatory cells and connective tissue within the inner layer of arterial walls leading to a local thickening of the vascular wall called atherosclerotic plaque. These plaques can remain asymptomatic for years, but an inflammatory reaction can develop causing the plaques to rupture and stimulate clot formation. If a clot completely blocks an artery, no oxygen can reach the downstream tissue—resulting in the sudden development of heart attack or stroke. The challenge is to identify patients with these dangerous atherosclerotic plaques before a heart attack or stroke occurs. Currently, there is no clinically available non-invasive imaging technique specifically to detect inflammation. F-18-fluorodeoxyglucose (FDG)-PET is being used but has important limitations. It is taken up by many cells other than inflammatory cells, including cardiac and brain cells. The strong signal present in the organs next to the arteries limits the precise analysis of the radiotracer uptake in atherosclerotic plaques. In addition, patients need to fast at least six hours before FDG injection to avoid interferences with blood sugar and muscular uptake of the tracer that impair image quality. “Ga-68-pentixafor binds more specifically to inflammatory cells than FDG and does not require the patient to fast for six hours before imaging,” explains Fabien Hyafil, MD, PhD, of Klinikum Rechts der Isar, Munich, Germany, and Bichat University Hospital, Assistance Publique, Hôpitaux de Paris, Paris, France. 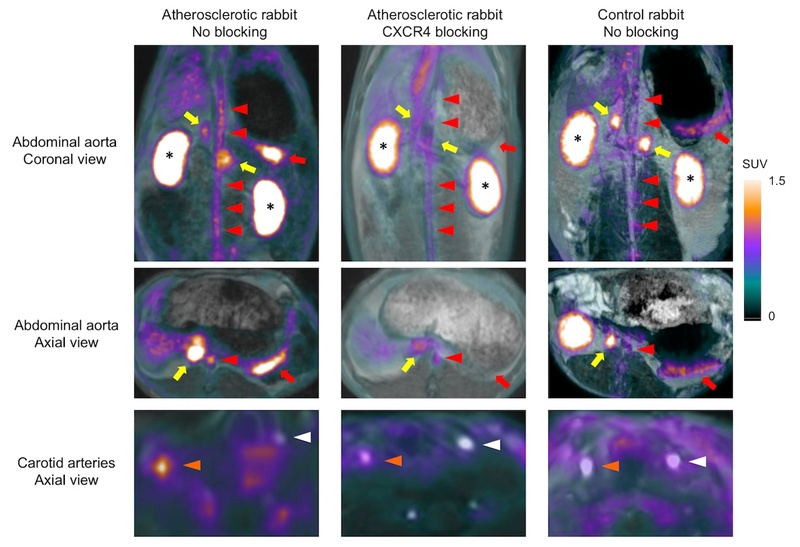 Figure: Representative examples of Ga-68-pentixafor uptake in rabbits using a combined PET-MRI system. Note the high uptake of Ga-68-pentixafor on multi-planar reconstructions in the organs expressing CXCR4 such as the spleen (red arrows) and adrenal glands (yellow arrows), which was nearly completely blocked by the pre-injection of AMD 3100, a potent CXCR4 inhibitor. Strong accumulation of Ga-68-pentixafor was also found in the kidneys (asterisks) reflecting the renal clearance of the tracer. In addition, high, focal activities were detected in the abdominal aorta (red arrowheads) and right carotid artery (orange arrowheads) of atherosclerotic rabbits, whereas no significant signal could be detected in the non-injured left carotid artery (white arrowheads) of atherosclerotic and control rabbits, as well as in the abdominal aorta and right carotid artery of control rabbits. Furthermore, focal activities detected with PET in atherosclerotic plaques of the abdominal aorta and the right carotid artery decreased significantly when the same rabbit was re-imaged after blocking CXCR4 receptors. Credit: Fabien Hyafil,MD, PhD, Department of Nuclear Medicine, Klinikum Rechts der Isar, Technische Universität München, Munich, Germany. Authors of the article “Imaging the cytokine receptor CXCR4 in atherosclerotic plaques with the radiotracer 68Ga-pentixafor for positron emission tomography” include Fabien Hyafil, Klinikum Rechts der Isar, Munich, Germany, and Bichat University Hospital, Assistance Publique, Hôpitaux de Paris, Paris, France; Jaroslav Pelisek, Iina Laitinen, Miriam Mohring; Michael Kallmayer, Johannes Fischer, Christine Baumgartner, and Hans-Henning Eckstein, of Klinikum Rechts der Isar; Margret Schottelius, Katja Steiger, Andreas Poschenrieder, Johannes Notni, and Hans-Jürgen Wester, Technische Universität München, Garching, Germany; Yvonne Döring and Emiel P.C. van der Vorst, Ludwig-Maximilians-Universität München, Munich, Germany; Christian Weber, Ludwig-Maximilians-Universität München, Technische Universität München, Klinikum Rechts der Isar, DZHK partner site Munich Heart Alliance, and Maastricht University, The Netherlands; Christoph Rischpler, Stephan G. Nekolla, and Markus Schwaiger, Klinikum Rechts der Isar, Bichat University Hospital, Assistance Publique – Hôpitaux de Paris, Technische Universität München, Ludwig-Maximilians-Universität München, DZHK partner site Munich Heart Alliance.